2 What Is a Landing Page? 3 Why Use a Landing Page? When you're about to launch a new marketing campaign, creating a special landing page on your site should be at the top of your list. A landing page is a page on your website that you link people to for a specific purpose. Marketers often create a new landing page as the destination for people who click on a particular advertisement. 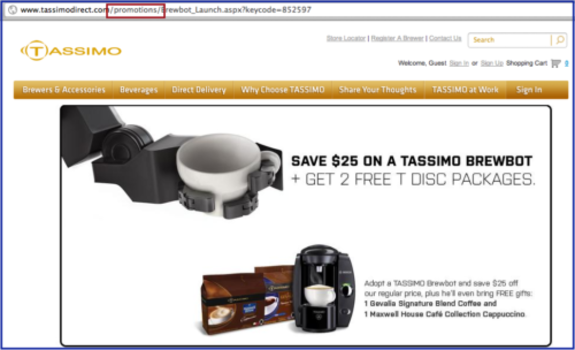 The example below shows the landing page you reach when you click on a Tassimo ad. If you look closely, you can see that the URL for the landing page has the word "promotions" in it. This indicates the page was designed for the company's ad campaign. Your website’s home page is the place to tell the world who you are and what you do. If you link people to your home page from an ad, you'll either force people to search around on your site for what the ad promised, or you'll have to put your promotion on your home page. A big promotion on your home page can dilute your primary message and confuse some of your visitors. Using a special landing page for each marketing campaign or ad provides a better experience for your visitors. It's also a good way to get people to focus on your offering, without other distractions. A landing page should include a brief overview of the product or service it's promoting. The page should include enough information for a visitor to decide right then and there that they want to purchase the product, or should provide a way to learn more. Buy a specific product right now? Request information so you can capture their email address or other contact information? Download a trial version of your product? Including a call to action and a button to click will help you convert visitors - that is, get them to do what you want. 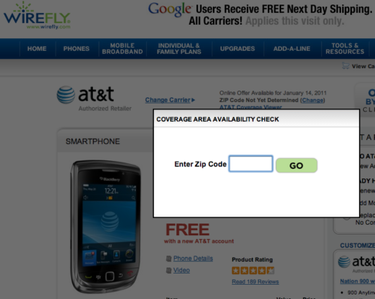 In the example below, the call to action is quite obvious: Wirefly wants to find out if you're in their service area before they even start trying to sell you a phone or phone plan. A call-to-action button can say almost anything, but it should urge action in language such as “Contact Us Today!” or “Click here to order...” or "Learn more." First-time visitors to your landing page will get there by clicking on an ad or other link, so the URL won't matter to them. But if someone wants to return to the page, they might try to find it in their bookmarks, in the drop-down menu of their browser's navigation bar, or by using a search engine. A simple, memorable URL can really help these folks recognize the page quickly. You don't have to create a new landing page to make your ads effective. If you want somebody to buy a specific product, and you have a page for that product already, you can use it as the landing page. But don't be careless about it. You don't want someone to click on your ad for HealthyPet Fur Conditioner and land on a catalog page that's filled with images of many different products. Your prospective customer might get confused, or feel impatient and click away without searching for the fur conditioner. Here's an example of a product page that works well as a landing page. Why? 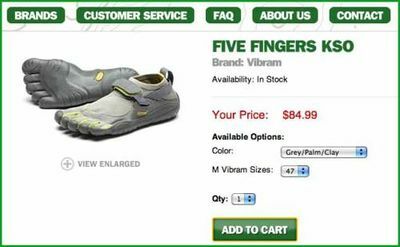 Because the product image is large and clear, and the call to action is obvious: "Add to Cart." Some companies go as far as purchasing a separate domain name a high-priority landing page. This can be useful if you want to create a distinct identity for the product and the campaign. It is, however, a strategy that's most suitable for a big company that already has a strong brand, not to mention plenty of cash. Investing in a new domain name, creating a separate website, maintaining it, creating the marketing campaign and analytics - all of this adds up. Plus, if the campaign is successful, lots of SEO (search engine optimization) benefit will accrue to the product-specific site - but not to the company's own site.